Does Your Business Need A Recycling Program? 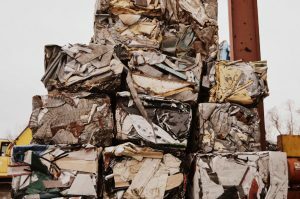 Implementing a commercial recycling program can be a daunting task, but with proper assessment and planning there is no need to panic. Every recycling program requires a methodical approach no matter the size of your company to guarantee efficiency, but with focus and initial preparation the benefits of your recycling program can be realized. Below are three considerations and tips that may be helpful when planning your company’s recycling program to ensure a successful and sustainable venture. Your Company’s Make-Up – How large is your company? How does it function? Where is your company located? These are some fundamental questions to account for when developing an efficient and effective recycling program for your company. Does your company consist of multiple departments, warehouses or facilities? In many cases diverse companies will have different recycling needs to address for individual departments or facilities and in turn require different processes to carry out a successful recycling program. Your Company’s Workforce & Clientele – Recycling needs are greatly influenced by the amount of traffic your company receives and the type of work or product your company specializes in. Companies differ in size and numbers and your recycling needs are dependent upon the density of people working for your company and the clientele you work with. Offices may require several indoor, small recycling bins throughout the space for employee use whereas an event center may require roll-off containers placed in strategic locations. Your Company’s Waste – Waste is different for all companies – the rate of generation and the amount/size of waste production impacts a company’s recycling needs by requiring more frequent waste disposal services or the use of special containers. Offices produce heavy amounts of paper and cardboard waste while a construction company generates large amounts of scrap that may require containers or other unique solutions. Analyzing your company’s waste stream will help you better understand what and how much you throw away which in turn will aid in determining what percentage of your waste can be recycled. Planning and implementing a recycling program can be intimidating – remember that West Virginia Cashin is here to assist you with every stage of your commercial recycling program, from start to finish. No matter your business – from corporate offices and event facilities to manufacturing and construction companies – Our waste auditors can help you determine the most effective recycling solutions for you. By offering a FREE Waste Audit for companies looking to begin or improve their recycling program we can work with you to develop a customized plan that benefits your company.